Archadeck of Columbus explores that area under your 2nd story deck and the ways we can transform that unused space into a covered outdoor oasis. 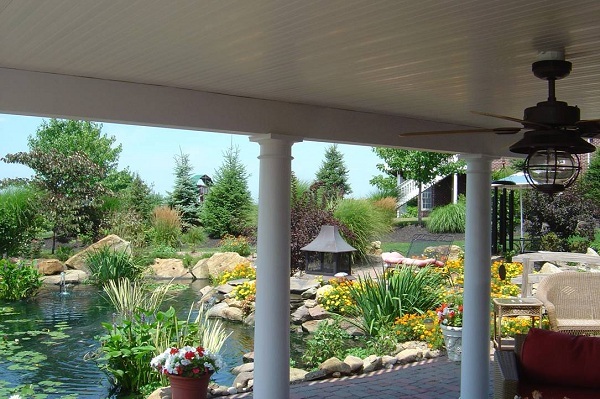 This gorgeous Columbus under deck space was created by using a DrySnap system. Whether you have an existing 2nd story deck or are considering adding one from scratch, taking advantage of the area below your deck can be a great way to get two outdoor living spaces out of one. Normally, the spaces between the deck boards will cause water to drip down below which can keep you from enjoying the space under your deck in wet weather. We are able to add an under decking system to your deck that prevents any water from dripping down through the decking boards. This is critical when creating a under-deck outdoor living area but also when building a porch under a deck. This Columbus 2nd story deck contains a lovely screened porch underneath. There are several different ways to make your under deck space watertight. If you have an existing deck, there are products that we can retro-fit to your existing structure to ensure no water gets through your decking. Keep in mind when you retrofit that it will not always be a 100% solution, but it will be 99% effective. The idea behind using a retrofitting system is to create a slope which feeds water down to a gutter to drain the water. When using retrofits, theses systems have components that create the slope needed to divert water. This means you will not have a flat roof, it will be slightly sloped. The slight slope is hardly ever noticeable. Some of the retrofitting products available are InsideOut, DrySnap, and Dry Space by TimberTech. Inside Out is a high-end premier aluminum product that comes in a variety of colors. Dry Space by TimberTech and Dry Snap are both plastic products, with a more limited color palette of white, bone and off-white. We have used each of these products to retrofit and each has shown beneficial results. You can even retrofit lighting and ceiling fans to keep the wiring safe and dry, but the key is to make sure it is done right. If you are starting your structure from scratch then you will have the ability to install a rain deck. With a rain deck, there are layers built within the structure with a slope that will divert the rain and water away from the deck. Comparatively speaking it is more expensive to install a rain deck than it is to retrofit an existing deck, but it is easier. By installing a full-fledged rain deck you take care of the cavities that are in-between the layers of the structure. You are able to create the slope needed and use rubber roofing and a cavity under which is the non-sloping ceiling. Because you have this cavity and layers of framing, there is more flexibility with adding accoutrements. Rain decks make the most sense when you are considering a finished lower level such as a porch or patio underneath your deck. 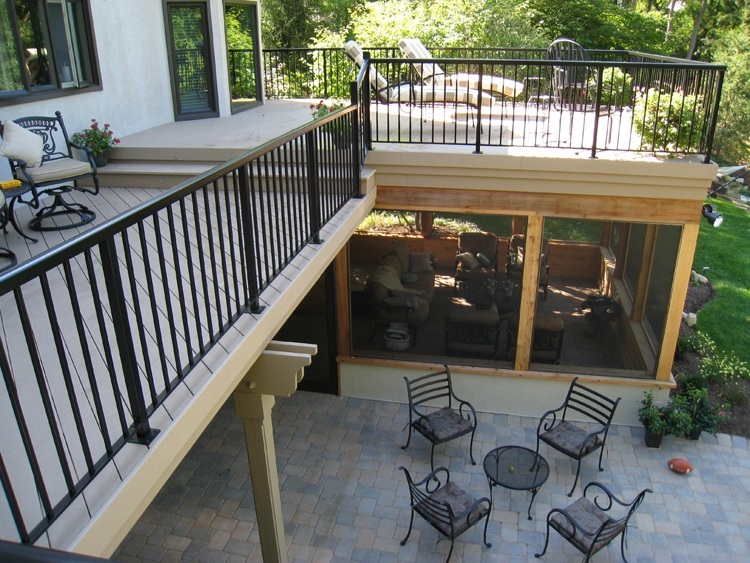 See more examples of outdoor oasis project that are a result of using the area under a second story deck by visiting our covered patio gallery and our screened porch gallery, both located on our website. Previous Previous post: Don’t underestimate the power of color when designing your Columbus, OH deck.